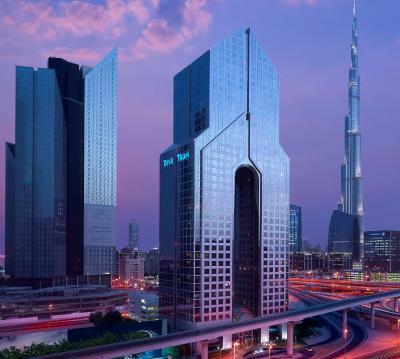 Lock in a great price for Dusit Thani Dubai – rated 8.5 by recent guests! Excellent staff especially Mr. Rashid who helped us upgrade the room when complained about the size of the room. 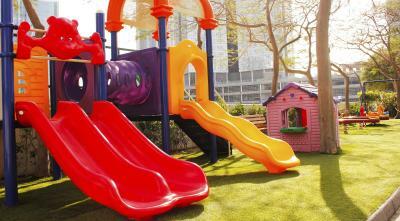 As usual very convenient location, the 2 bedroom apartment was just amazing, and convenient with the kids. This hotel was under my expectation, the one in Abu Dhabi is far better than this. The staff were behind hospitable. The services provided were amazing!! Location phenomenal. Excellent location and stuff. 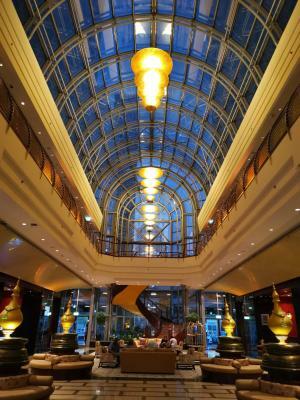 I recommend this hotel for family, very nice view toward Burj Khalifa and Shikh Zayed road. We booked an executive suite with a tower view. The room was clean and quite. Location was very good. Staff are very helpful and friendly. I also requested a special BD surprise for my husband and they did an amazing job with flowers fruits and cake it was beyond my expectations. I had a very good night sleep , comfy beds and great breakfast thanks to salima! She was always around and was keen on making us happy. The bar on the 24th floor was interesting and had great staff. We went back a second night for drinks. All of the employees that I met during my stay were polite and friendly. Breakfast was decent. Views from 31st floor are great. 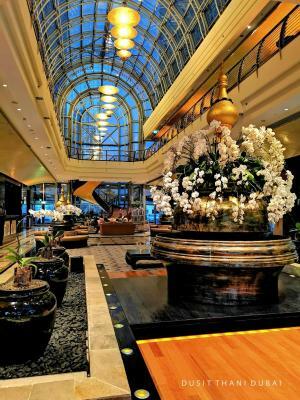 Dusit Thani Dubai This rating is a reflection of how the property compares to the industry standard when it comes to price, facilities and services available. It's based on a self-evaluation by the property. Use this rating to help choose your stay! One of our top picks in Dubai.Dusit Thani Dubai is located on Sheikh Zayed Road, in the heart of Dubai’s financial district. The World Trade Center and the International Convention Center are within easy reach. The guest rooms are decorated in a contemporary Thai style, complemented by modern bathrooms. The luxury amenities include bath salts. 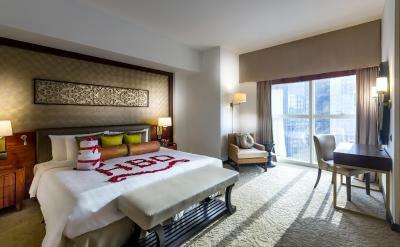 The rooms on the upper floors offer panoramic views over Dubai. Combining a high-tech glass tower with traditional Thai décor, this luxurious hotel features free WiFi and a rooftop pool. 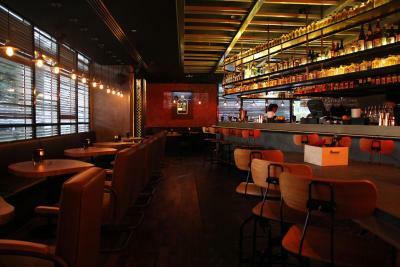 It offers a choice of 7 food and beverage outlets. Benjarong, Dusit Thani’s signature restaurant serves authentic Thai cuisine in a traditional setting. 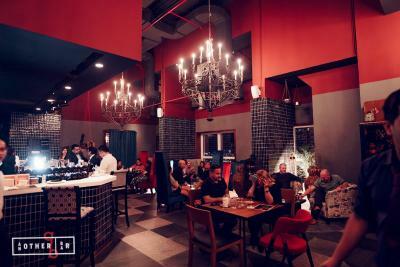 There is Jones the Grocer a contemporary gourmet, Nippon Bottle Company and a poolside bar. 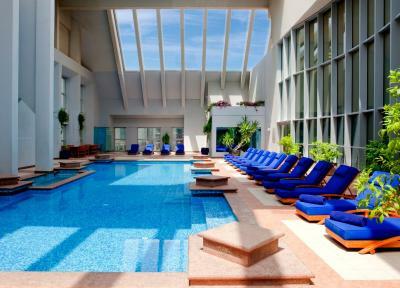 Leisure facilities at Dusit Thani include a fully equipped gym with a view and a hot tub. 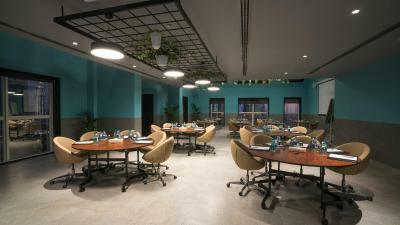 Guests can browse the in-house shops or let the staff of the beauty salon pamper them. A free shuttle service is offered to the Dubai International Financial Center, the Dubai Mall, Jumeirah Beach Park and other key selected areas. 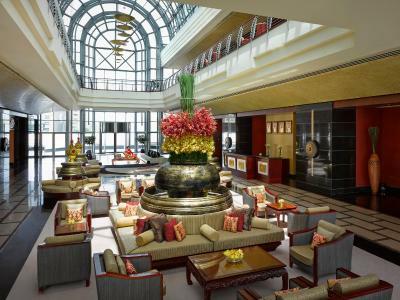 When would you like to stay at Dusit Thani Dubai? 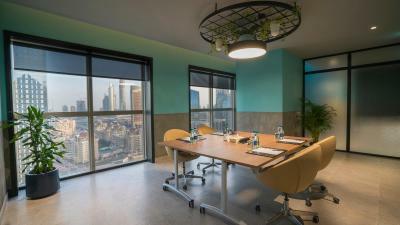 On upper levels, this modern, air-conditioned room has a view of Dubai. A flat-screen TV and a minibar are in each one. This luxurious apartment has a separate kitchenette and living area. It features both traditional Thai-inspired hand-carved artwork and furniture coupled with striking Jim Thompson fabrics. It includes a flat-screen TV and media hub technology. Including Executive Lounge access, this air-conditioned suite has a spacious sitting area with a flat-screen TV. It includes a Gaggia Espresso machine and a bathroom stocked with luxury bath salts. A one way complimentary airport transfer to Dubai International Airport (DXB terminal 1, 2 & 3) is also available. Please be advised that visitors will be charged per consumption. Children below the age of 12 years are not allowed inside the lounge. Alcoholic beverages are served only to guests 21 years and above. 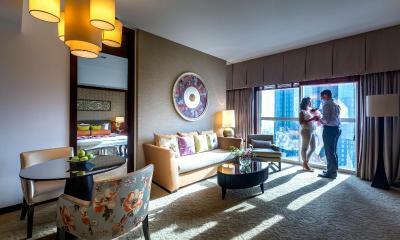 This extra spacious suite consists of a bedroom and living room, and has views of Dubai. 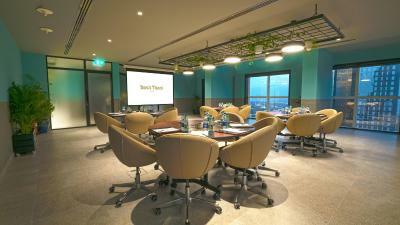 On upper levels, these modern, air-conditioned rooms offer views of Dubai. A flat-screen TV and a minibar are included in each room. 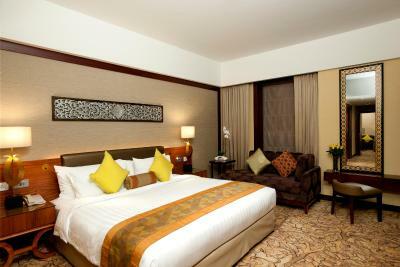 Including Executive Lounge access, this air-conditioned suite has a spacious sitting area with a flat-screen TV. It has a Gaggia Espresso machine and a bathroom stocked with luxury bath salts. 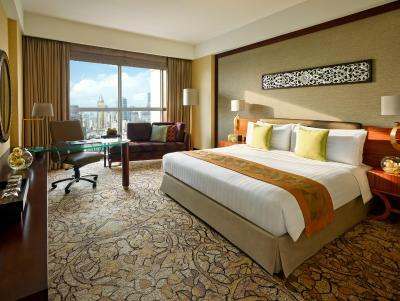 This extra spacious suite consists of a bedroom and a living room, and has views of Dubai. - Luxury bathroom amenities, such as bath salts and vegetable-oil soap. Please be advised that visitors will be charged per consumption. Children below 12 years old are not allowed inside the lounge. 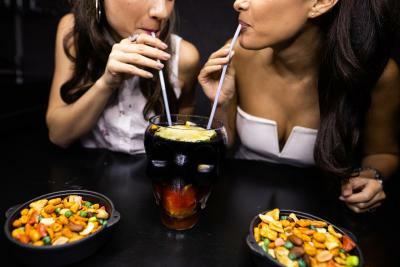 Alcoholic beverages are served only to guests 21 years old and above. This double room features a cable TV, bathrobe and mini-bar. 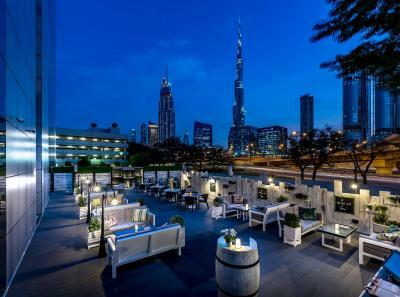 The air-conditioned Dusit Club Room has panoramic views of Burj Khalifa and a spacious sitting area with a flat-screen TV. - Gaggia Espresso machine and a bathroom stocked with luxury bath salts. Please be advised that visitors will be charged per consumption. Children below the age of 12 years are not allowed inside the lounge. This apartment comes with separate kitchenette and living area. 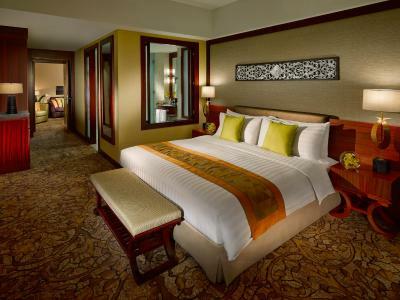 It boasts of both traditional Thai-inspired hand-carved artwork and furniture coupled with Jim Thompson fabrics. 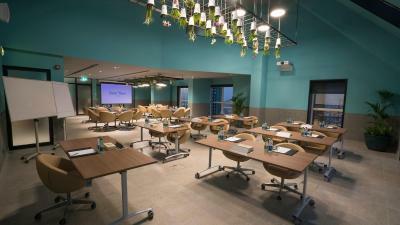 It features a flat-screen TV and media hub technology with view of Burj Khalifa. This apartment features a satellite TV, mini-bar and bathrobe. 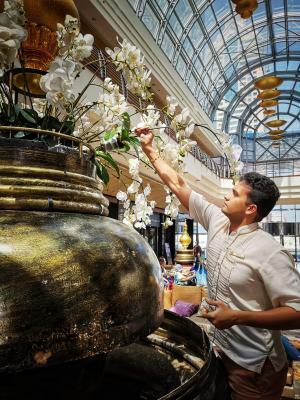 Dusit Thani Dubai is an iconic 5-star luxury hotel that captures the essence of Thailand in the vibrant centre of this cosmopolitan city, the jewel of the UAE. 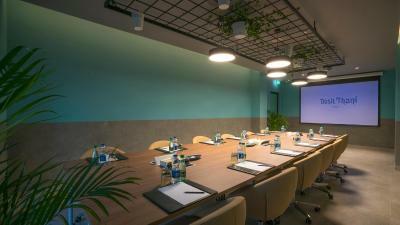 The hotel is strategically located just five minutes from Dubai’s main business hub, within walking distance from the nearest metro station and just 15 minutes from the airport. 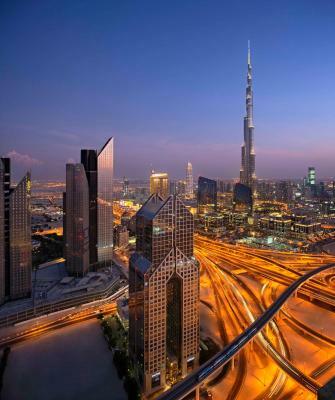 In addition, the world’s tallest building, the Burj Khalifa, and the world’s largest shopping mall, The Dubai Mall, are just a short distance from Dusit Thani. 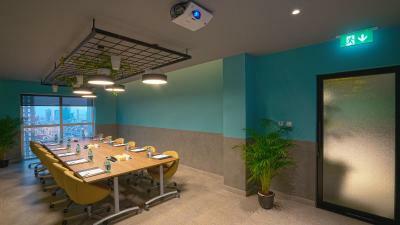 The hotel also provides complimentary scheduled pickup and drop-off to Dubai International Financial Centre, major shopping malls, and other attractions. Enjoy jaw-dropping views of Dubai’s futuristic skyline while relaxing in the comfort of Thai elegance and grandeur in one of our fully-renovated luxurious rooms or suites. 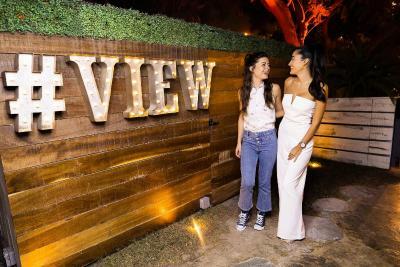 Sample thoughtfully prepared dishes inspired by flavours spanning the globe at one of the hotel’s seven dining and entertainment outlets, have a pampering and revitalizing spa treatment at Namm Spa or soak away your cares in our amazing rooftop pool. House Rules Dusit Thani Dubai takes special requests – add in the next step! Dusit Thani Dubai accepts these cards and reserves the right to temporarily hold an amount prior to arrival. Please note that the credit card will not be charged manually by the hotel, for all non refundable bookings hotel will send you link to make secured credit card payment which has to be completed within 24 hours of booking made to firm up your stay with Dusit Thani Dubai. Too expensive for the room..windows not clean ..no nabkins or tissue in room.. Needed to provide a reminder for room makeup on one of the days. But of a wait to check out, maybe consider separate checkin and check out desks. We had only one tissue box in 2 bed rooms, so it would have been nicer that there are more. And my wife couldn't style her hair because the hair dryer in the room didn't really have hot wind. But it was great overall. It's located in the center of Dubai so it was very convenient to access to any places. The room was nice and big and its view of Burj Khalifa was wonderful! The staffs were very friendly and helpful. errr . . . the weather ?? Great breakfast buffet and very helpful and considerate staff throughout the facility. Excellent and very friendly staff! Great family room, super location.